Posted on Sun, Jul 26, 2009 : 4:43 p.m.
St. John's Wort, Hypericum perforatum, has performed well in double blind placebo controlled studies as a treatment for mild depression. Most of the information and common knowledge about this herb has focused on it's use as another SSRI (Selective Serotonin Reuptake Inhibitor). There is so much more to this herb! Almost 20 years ago I published an article describing how St. John's Wort could be used for nerve regeneration. In this case, a young client had severed the nerves to his arm at the shoulder. He had pain and almost no functional use. After two years, he had regained the use of the arm enough to again play the saxophone. 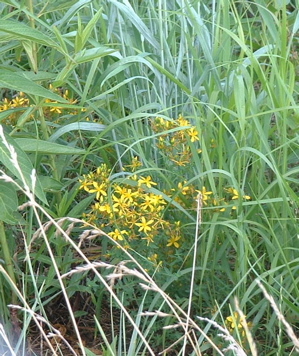 Topical use of St. John's Wort was a likely therapy that made that possible. St. John's Wort is an antiviral, and many years ago I talked to some UM students in the School of Natural Resources doing research into its possible use against HIV. Somewhere in my files I have some of the findings they shared with me more than 15 years ago.The present antivirals were developed first, and that research was mostly dropped. It is considered an invasive herb, yet it is so beneficial I will confess to only encouraging it on my property, with mixed success. It has taken over just a few hours north of us, and in a trip north last week I saw it everywhere as I canoed along The Betsie River that ends at Frankfort. It can be used for sore muscles both topically (made into a salve or oil) as well as in internally in tincture form. A tincture is an alcohol extract made from the flowering tops, this is a perfect time to pick it for that purpose. Same with the oil, always used externally, and I have a half gallon made up and waiting 6 weeks to be decanted and then stored in my refrigerator. Because of its properties as an antiviral as well as a nerve healer, it may be the perfect herb for shingles, Herpes Zoster. Used as an oil topically, it can take away the pain and reduce the time of the shingles attack. I've had recurrent shingles for over 25 years and it has made all the difference. My shingles outbreaks are now a mild disturbance, never to the point of pain, and fade within a week or less. Compared to the possible complete misery and debilitating effects of a full blown shingles attack, I'm grateful to have St. John's Wort Oil. Conventional medicine to treat shingles has some antivirals to offer, as well as agreeing that using the supplement L-lysine and temporarily restricting dietary intake of meat, nuts, seeds, and beans (high in the amino acid Arginine) can also help. We do know of three possible side effects from St. John's Wort. They are very important to note. The most serious is that it can interfere with drugs that are processed in the liver. It affects the cytochrome P450 system, and can cause some drugs to be less effective including birth control pills and some types of anesthesia. Topical use probably avoids this problem, as well as the second concern of possibly interfering with prescribed antidepressants. 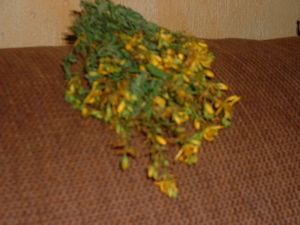 Because St. John's Wort taken internally acts as an SSRI, using it with drugs that have similar actions is a concern. A knowledgeable health practitioner should absolutely be involved in determining if that can be done safely. The third side effect is more uncommon, but some people as well as animals have developed a sun induced skin sensitivity and even a rash after using St. John's Wort internally. I had a student with dark skin who had this happen, so it can affect almost anyone, not just light skinned people. If you think this may be a helpful herb for you, now is the time to pick it and prepare it. If you prefer to use the already made preparations, at least you can seek out the plant and now know what it is you're taking! Most people who use St. John's Wort regularly would walk right by the lovely plant without a clue that this is what they are using it regularly. 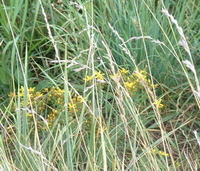 Before and after the flowering period, the green plant fades back into the landscape and can be hard to identify, except for one unusual trait. Pick one of the small leaves and hold it up to the light. You will see what look like tiny perforations in the leaf. Hence the latin name, Hypericum Perforatum. Linda Diane Feldt is a local holistic health practitioner and a regular blogger for AnnArbor.com. You can follow her daily wildcrafting reports on twitter. This blog is educational only, and if you're smart you wouldn't use the generalized information from an on-line blog to treat serious health conditions but would of course consult a health care professional. Wed, Aug 15, 2012 : 4:37 a.m.
Hello Linda Although I see MrCicerone's comments to you about &quot;alternative&quot; hogwash I am extremely interested in what you have to say. I already firmly believe in the benefits for St John Wort in treating depression and anxiety and was excited to see your comments about nerve regeneration. My son (now 21) contracted H1N1 virus (Swine flu) in July 2009. This left him in intensive care for 31 days fighting for his life with pneumonia, dangerously high blood pressure/heart rate. Post his coming out of an induced coma, he was also left with extensive nerve damage in his left arm and hand (which has repaired itself over time) but also with partial paralysis in his left leg (below the knee) and foot. He spent 2 months in a spinal unit learning to walk again and has never fully recovered although 3 years have now passed. His foot is now permanently raised at the back as the nerves are holding it up and he has constant pain in his foot. Doctors say no operation can fix his foot and they are now looking at putting him back on Gabapenten to alleviate the pain that has returned. We understand that the damage he suffered from H1N1 is at the extreme end of those who contracted and lived to tell the tale. They have offered no hope of a recovery any further than he is as following EMG testing his nerves have only slightly reinnervated so any advice you could give from a hollistic point of view that would aid in either nerve rejuvernation or pain relief would be of huge benefit. It is heart breaking to see someone so young left so debilated from what we believed initially was a terrible case of the flu. Thu, Aug 16, 2012 : 2:02 p.m.
You can contact me privately holistic@lindadianefeldt.com or call 734-662-4902 Sunday-Thursday 9am to 7 pm ET. I'd be happy to share what I know and have experience with. Thu, Jul 30, 2009 : 3:05 p.m. I'm thrilled to have my first bit of anonymous criticism. The purpose of the posts, at least so far, is not to present a scientific critique with citations and such. The people printing recipes are not being asked to cite studies on the value of broccoli either. Some articles will be more in depth, some are not. There is anecdotal evidence, there is evidence from scientific studies, as well as other types of evidence. I'll make every attempt to be clear which I am using. There are plenty of herbs that have been overlooked and unstudied that have substantial value. Science can be very slow to adapt. That's true with herbs, it is also true with medical technology. I hope you are aware that there is just not enough money (and financial motivation) to set up long term studies on most of the commonly used herbs. That doesn't mean the clinical experience is "hogwash", it means the scientific validation of a double blind placebo controlled trial hasn't happened yet. The hypothesis is still open. That's science. Dismissing a theory or an action because it has not yet been studied, especially when there is multi-year use and positive clinical reports, is being close minded. We do many things in life not yet validated by science. And medicine is full of common use that is later proved wrong. Herbology has a few thousand years of experience with being horribly wrong, as well as amazingly right. In the meantime? Further education and discussion would seem to be a positive thing. I'd like to promote that. I do disagree with your paraphrasing of my "disclaimer". I think the message is actually very clear, that a discerning consumer delves into these things more deeply before accepting the general advise of a stranger. I would think we would agree on that point. Tue, Jul 28, 2009 : 8:30 p.m. Typical "alternative" hogwash. The longest post in this section for today, making grandiose claims for a rather well-studied and undistinguished botanical, followed by a weaselly disclaimer that could be paraphrased as "don't blame me if my advice is hokum." Any substance that could be demonstrated to stimulate nerve regeneration would be pharmacological gold and incorporated into standard treatment modalities.